As we enter into November, I’m starting to think about entertaining. Not the way I entertained this summer — poolside with the barbecue smoking, cold libations, peak-of the season salads and fresh fruit desserts. No, now our get-togethers, while still informal, take on a more sophisticated tone. We’re wearing clothes after all – instead of bathing suits! When my guests arrive, I like to welcome them with a cocktail and some nibbles. Sometimes I’ll have spiced nuts or warmed olives with zest. Always good — but sometimes I do just a little bit more. 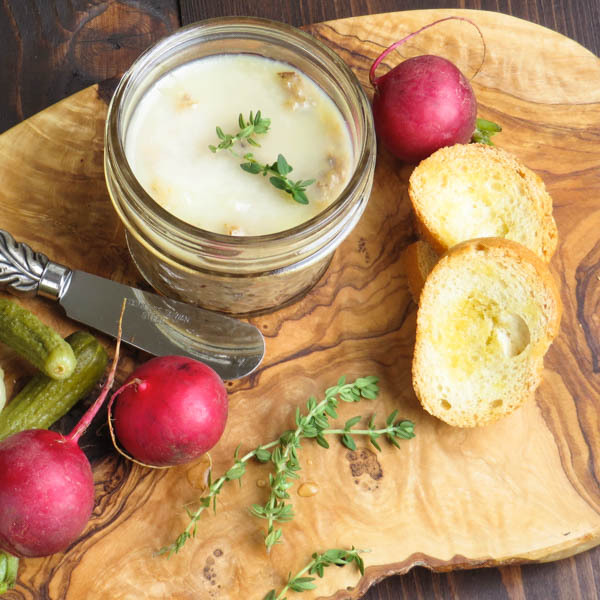 Pork rillettes with crostini, crunchy radishes and cornichons are a delicious and unexpected way to ease into the evening. This is like making an antipasto platter, but instead of cured meats from the deli counter, I serve my own savory pat? — in a jar! Since this is a “do-in-advance” recipe, I don’t have to worry about assembling bite size canapes at the last minute. More time with my friends – less time prepping! While this does take some time, it’s really easy to make and the oven does most of the work. 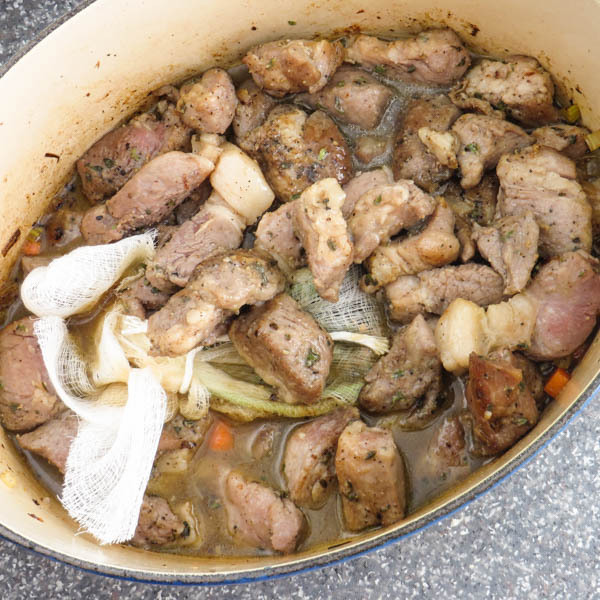 After braising the pork with vegetables and the spice pouch, it goes into the bowl of a stand mixer and seconds later you’ve got the rillettes. 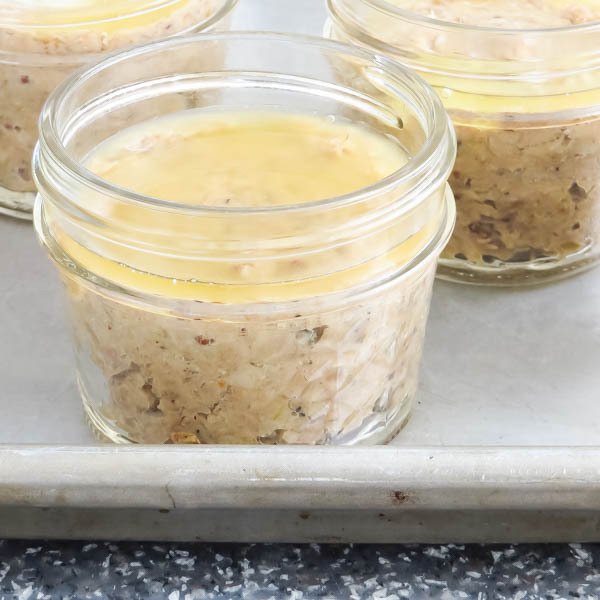 Fill ramekins or those cute little mini-canning jars with the pork mixture and spoon a tablespoon of melted butter over the top to seal the potted meat from the air. Done. It’s so easy and so freakin’ good! This rich, unctuous blend is irresistible and can I tell you how good it is with a good glass of wine or spirits? Yes, that good! The nice thing about this is that it makes quite a bit, so you can have a few on hand when company stops by, or give some as gifts along with a sleeve of your favorite crackers or a demi-baguette. Your friends will love you for it! 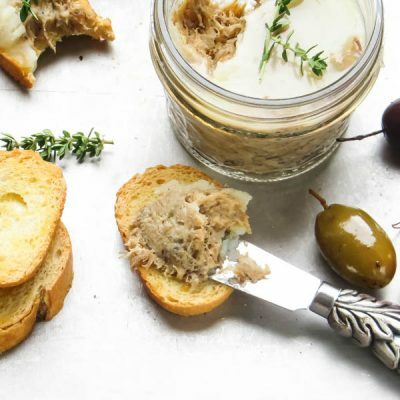 Not only are these rillettes ah-mazing on a toasted crostini with a glass of wine, they also make perfect hostess gifts! 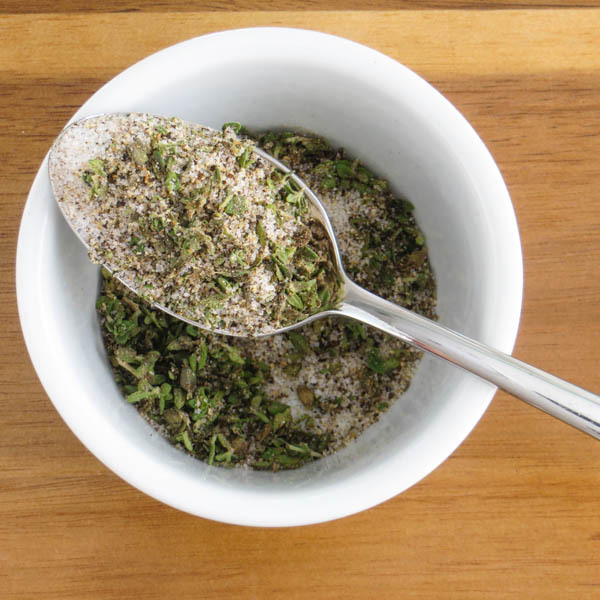 In a small bowl combine the salt, pepper, ground coriander, ground allspice, ground cloves. Stir to combine. 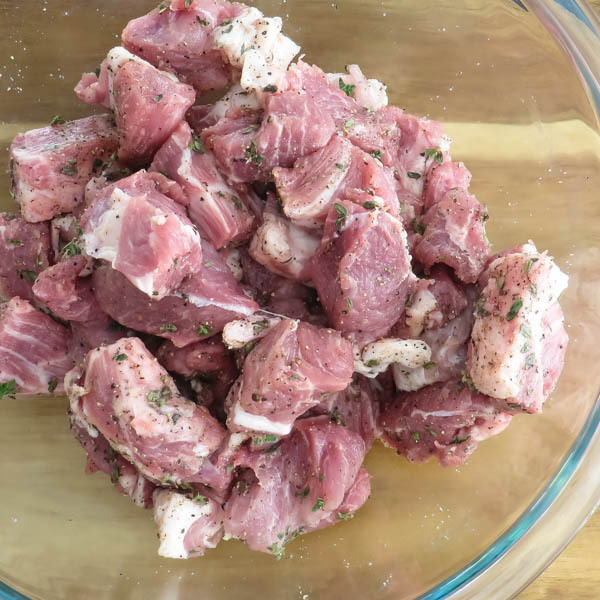 Place chunks of pork in a medium bowl and sprinkle with spice blend. With your hands mix the spices into the pork until they are evenly distributed in the meat. Cover with plastic wrap and refrigerate for 12-24 hours. Heat a dutch oven over medium high heat. Add pork and cook, turning occasionally until meat is browned and some fat has rendered, about 5-8 minutes. 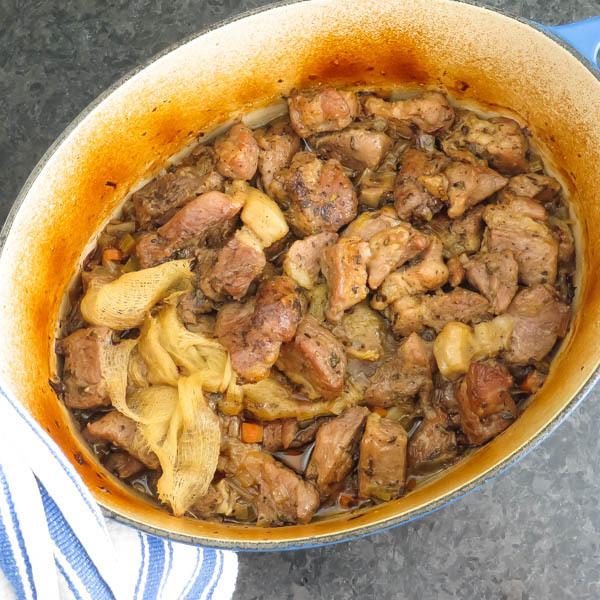 Transfer pork to a bowl. Scoop 2 tablespoons of rendered fat from the pot into a small bowl and reserve for later. Add carrots, leeks, celery and onion to the dutch oven. Cook over medium heat until vegetables are slightly softened 3-5 minutes. Add broth and use a wooden spoon to scrape up the browned bits from the bottom of the pot. Add the pork and any collected juices back to the pot. Remove the pot from the heat. 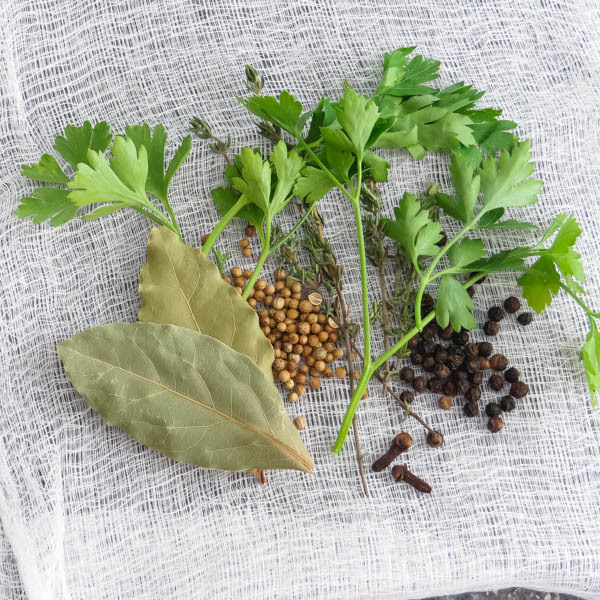 Assemble the bouquet garni by placing the thyme, parsley, bay leaves, peppercorns, coriander and cloves in the center of the cheese cloth. Draw the ends of the cheesecloth together and tie with kitchen string so that the contents can't escape the pouch. Add the bouquet garni to the pork, pressing it into the broth. Cover the dutch oven and place in the oven. Cook for 2 1/2-3 hours, until pork is fork tender. Remove pot from the oven. Discard the bouquet garni. 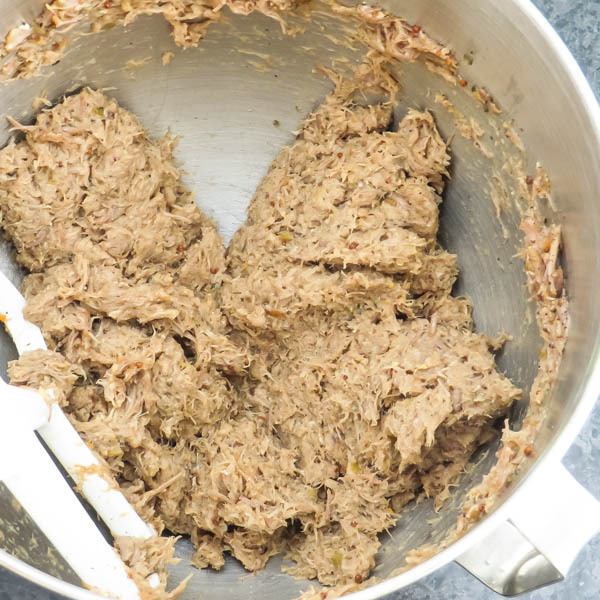 Transfer the pork mixture to the bowl of a stand mixer. Use the paddle attachment on low to medium to shred the pork and vegetables. Add dijon mustard, reserved fat, nutmeg and cognac. Blend to combine. Using 1/2 cup ramekins or canning jars, fill with pork mixture, pressing down to remove air pockets. Smooth the tops of the pork to make them as even and flat as possible. 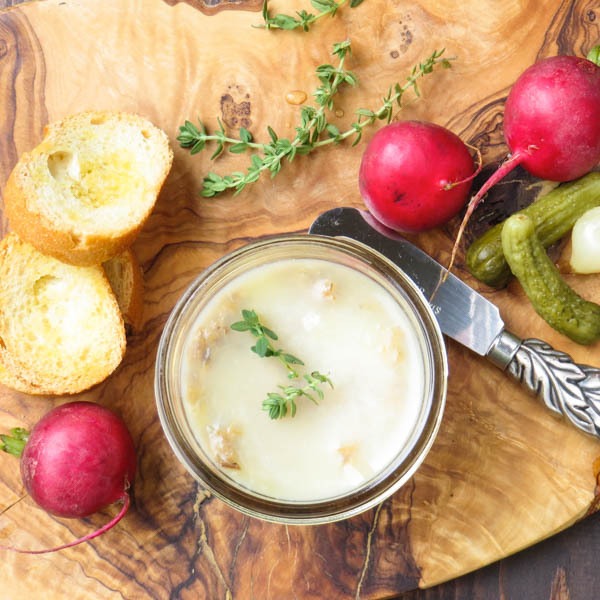 Use a damp paper towel to wipe the mouth of the ramekin or canning jar, so that there are no bits of pork or residue on the side. 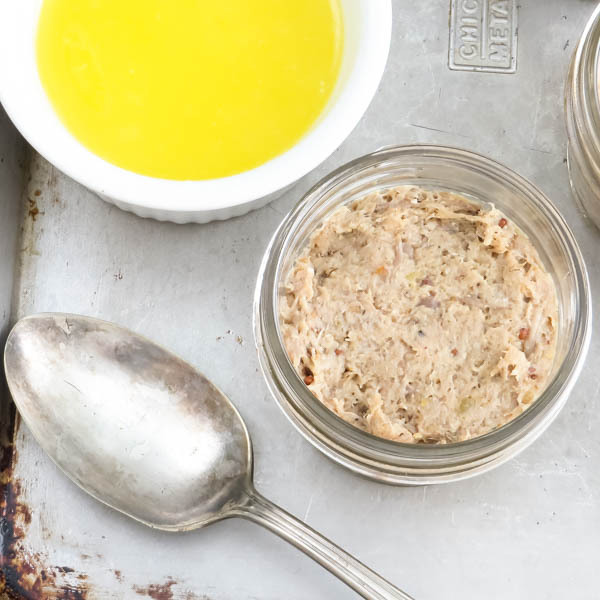 Spoon butter over each ramekin so that it covers the pork mixture. Cover and refrigerate until set. 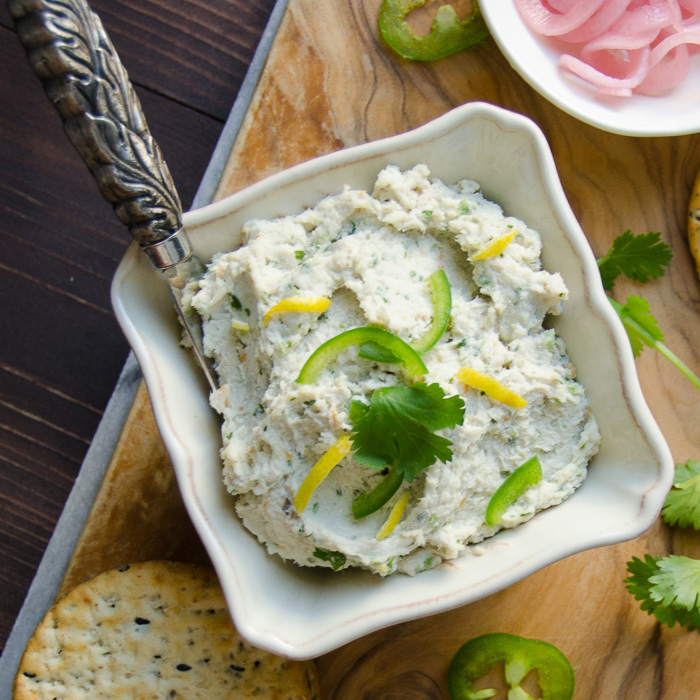 Serve with crackers, or crostini. 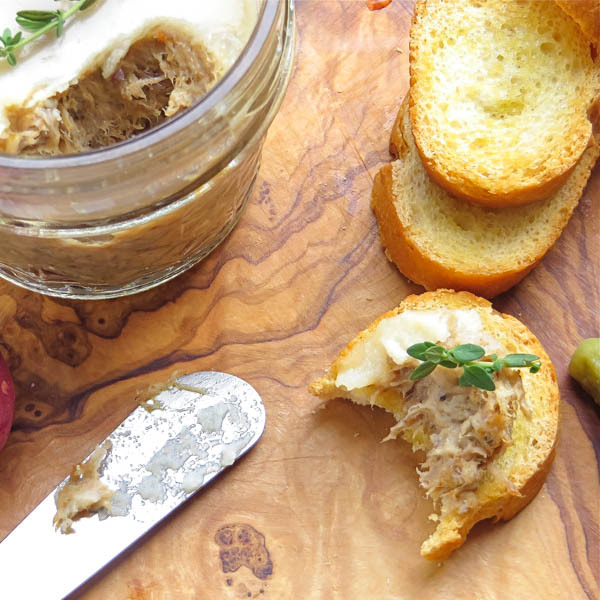 Hey Lisa, definitely using this recipe to make my long awaited pork rillettes…how long do these keep in the frig? I’m guessing two weeks. Thanks so much! By the way, I’m already addicted to your blog and have been forwarding links to friends. Thank you so much Rebecca! I’m glad you like it! 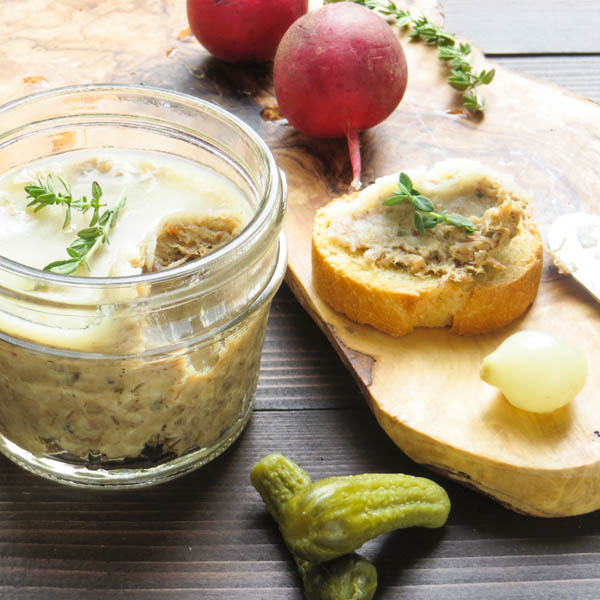 Yes, the rillettes should keep refrigerated for two weeks — if they last that long. This is a nice little app for Fall. I can see myself serving this with a chilled bottle of Zin! Thanks. That would be lovely. I’ll be waiting for my invitation! 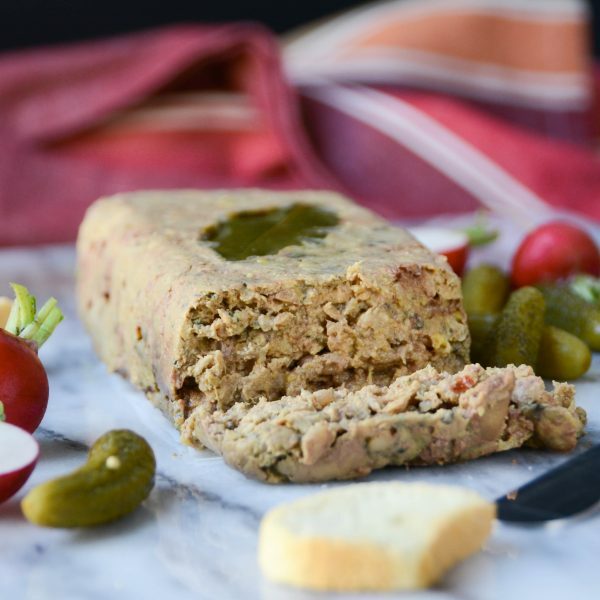 This pork rilletes sounds delicious! I’ve never made this before, but I love the ingredients! Saving for our next get-together. Thank you for posting! This is something new to me. Sounds so flavorful and delicious. Oh- you need to make this one! What a fun recipe and a great way to entertain your guests. This would be perfect on a fruit and cheese tray!